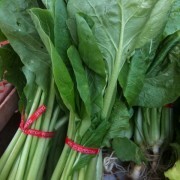 Komatsuna is a leafy green vegetable related to the common turnip. It has blue-green leaves, light green stalks, growing upright in a bunches like choys only taller than most choys. It grown and used culinarily mostly in Japan and Taiwan. Komatsuna ‘small pine tree greens’ in Japanese, is also known as Japanese Mustard Spinach. It is an excellent source of calcium. – Komatsuna is usually stir-fried, boiled and added to soups. – It can also be added raw to salads. – Flavor grows stronger and hotter (like turnip green) as it matures – bigger and taller the bunch possibly the more flavor! – It is often salt pickled Japanese tsukemono style – an easy way to preserve! Store unwashed, in plastic bag or wrapped newspaper (this is common in Japan), in the refrigerator for up to 4 days.